ESPN’s Greatest Athlete of All Time reinvents himself. When you’ve been named ESPN’s Greatest Athlete of All Time, and you decide to put your name on a product, you want to ensure that it is of a caliber worthy of that name. How do you do that? Bo knows. Just as in sports, when a player fumbles the football or strikes out in baseball, it’s primarily the player, rather than the team, who takes the flak. In the same way, “If someone buys Bo Jackson’s 34 Reserve and has a complaint, it is Bo Jackson’s name that they will remember. I have spent countless hours developing products under my label, and that’s the last thing I would want to see,” he said. In February, QA Editor Lisa Lupo visited the Two Rivers plant for an exclusive interview with Bo Jackson and a tour of the production facility to discover why the legendary athlete decided to transition into food, how he chose the products that would bear his name, and what, exactly, Bo knows about beef. Bo conducts regular quality checks of products that bear his name. “In the end, if the end user gets a bad product, my name gets mud on it. I’ve had to drop companies because of that,” he said. Two Rivers for Bo Jackson’s 34 Reserve choice, and prime steaks. Schweid & Son’s for Bo’s 34 Burgers. Blackhive for products such as pasta, beans, canned fruits and vegetables, rice, sweeteners. “It’s not always good to have someone else be in charge of your name and likeness, so I started my own company,” Bo said. What Two Rivers has going on is not only a quality product, but also a “young, hungry sales force”; an exceptional focus on cleanliness and food safety; a solid supply chain; plans for expansion; and a culture of involvement. “Everyone here, from the owner down, is hands on,” Bo said. It is a facet that especially resonates with him because of his own personal involvement. “I try to be hands on with the companies I’m selling my product to.” He joins in on sales calls and cuttings, telling the purchasers, “If you have a problem with quality, taste, or supply, call me first – so I know who to call; who to chew out,” he said. But even with all his involvement, Bo knows well enough to keep the production in the hands of the experts, particularly in this case, because 34 Reserve is an enhanced product. Bo was given a variety of tastings and options on specifications for the line of meat that would become Bo’s 34 Reserve. Meat arrives at Two Rivers in boxes in which individual slabs of beef are Cryovac wrapped. Before being allowed in the production room, the bagged meat is run through a rinsing system built into the conveyor line. Once in the production room, the meat is removed from the bag then run through a high pH, antimicrobial surface treatment. Because the meat is to be marble enriched by injection, translocation is a potential risk. So this treatment ensures there is no bacteria on the surface that could be carried into the meat. 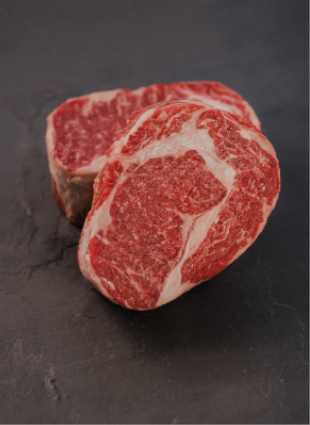 Based on product specifications, beef tallow is injected into the meat to enhance marbling. This is one area in which Two Rivers’ innovation is evident. When the injector needles penetrate the meat, the meat must expand; when the needles are retracted, meat may want to stick in them, causing waste, inconsistency and a loss of quality, explained Director of Quality Assurance Craig Letch. To prevent this, Two Rivers developed innovative “hold downs” which dynamically adjust to individual cuts keeping the enriched meat from sticking to the needles. The product is then vacuum-bagged, weighed, and labeled. Throughout the process, the temperature is controlled to within two to three degrees – until it is run through the spiral chiller which adds crust on the packaging so it stays thoroughly chilled as it is boxed. A SYSTEM OF CONSISTENCY. The brine solution and marbling are specific to each cut of meat and each product. Once specifications for a product are decided, consistency is maintained through the company’s iFix based electronic operating system, through which it can monitor every point in the process. The system provides a visual rendering of the plant’s floor plan, with flow activity represented in real time through a “green means go” image, Letch said. If the process flow around the floor plan is green, it means it is in operation and flowing correctly. Bo’s selection of Two Rivers to produce his steak was a fairly easy one once he toured the plant and saw its technology, innovation, and sanitation practices first hand. In addition to Two Rivers’ projection of the visual on a large screen in its conference room, the system can be remotely accessed, monitored and controlled by authorized personnel at the company’s corporate offices. 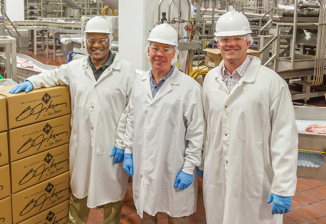 As a result of Two Rivers’ innovative techniques, “Our competition is not the other enhanced meats, it is the higher-end meat,” Carlson said. In fact, one of the challenges the company faces is “getting people past the stigma of enhanced product,” he said, adding, a lot of processors have tried to make a good enhanced meat, but a lot have failed. Because of that, it is the face-to-face cuttings and tastings that sell foodservice providers on the steaks. “We cook side-by-side with other enhanced products, then typically compare against a grade or two higher,” Carlson said. In foodservice, where costs are continually escalating, this provides an attractive alternative, enabling the restaurants to reduce costs without reducing quality. It was also just such a tasting that helped to sell Bo on Two Rivers. “I thought I was eating a filet,” Bo said, “But it was actually sirloin.” From that tasting, he then was given various tastings and options on specifications for the line that would become Bo’s 34 Reserve. “I don’t understand it all, but they do,” Bo said. “They are knowledgeable about what’s going on and how the process works, so the end user gets a top-notch product.” A top-notch product at a good price, that is. “That’s important to me because I don’t want just the upper middle class and higher to be able to afford my product. I want the couple with three kids to be able to go out and enjoy a steak dinner,” Bo said. “I didn’t grow up with a silver spoon in my mouth,” he said. In fact, there were days that he and his nine siblings, who were raised by his single mother in a three-bedroom house in Bessemer, Ala., had little food to even put on a spoon. It wasn’t that the family never had steak. They did, but, Bo said, only if it was on sale at the local store, and a day or two until – or past – its expiration date. One of the key aspects that enables this sanitation is Two Rivers’ design standards, including having “set offs” for all equipment and anything mounted to walls, so that all surfaces are capable of being reached and cleaned. Bo Jackson attended Auburn University, where he lettered in track, baseball and football – for which he was awarded the 1985 Heisman Trophy, and became the #1 NFL draft pick. Bo played professional baseball for the Kansas City Royals and Chicago White Sox and football for the Los Angeles Raiders. He was the first athlete to be named an All Star in two major sports. In 1991, a hip-injuring tackle, that required a hip-replacement surgery, put an abrupt end to his illustrious sports career. Although he went on to professional ball before graduating college, Bo eventually returned to complete his Bachelor of Science degree in Family and Child Development at Auburn in 1995. He founded Bo Bikes Bama in 2012, embarking on a five-day bike journey across Alabama to visit many of the towns ravaged by the tornadoes that had ripped through the state the previous year. In 2013, it became an annual event which raised money to support the Governor’s Emergency Relief Fund. Beyond his sports career, Bo is best known for the “Bo Knows” Nike shoe campaign. Additionally, some areas of the plant were built with stainless steel walls and surfaces; not only is stainless steel easily cleaned, but being able to weld mount equipment without penetrating the surface and creating holes in the wall has definite sanitation benefits. Bo works closely with Two Rivers Director of Quality Assurance Craig Letch (center) and Assistant Director of Sales and Marketing Jeff Carlson (right) to ensure the product that bears his name reflects his commitment to quality and value. Throughout the manufacturing area, all pipes and other internal structural elements are mounted away from the walls with spacers, which, again, reduces potential harborage points and provides for thorough cleaning. Additionally, much of the equipment, as well as the plant itself, is Two Rivers’ own design. The Two Rivers plant also has its own a machine shop, machinists, and engineering department onsite. But such innovation and internal design is not without investment, resources, and management buy-in. “It doesn’t just pencil out, you have to believe in it,” Letch said. “The thing that impresses me most is that nothing is flush against the wall,” Bo said. “They developed spacers to hold everything away from the wall. That’s neat. They didn’t have to do it, but because they did it, that spoke to me about their seriousness. CUSTOMER VALUE. Currently 34 Reserve is available only to foodservice operations, but Bo and Two Rivers are working on a retail focus, with a goal of having a consumer product available by the fourth quarter of 2016 or early 2017. “We want to kick off the retail side in the southeast where I’m from – where people know me best,” Bo said. Two Rivers’ electronic operating system can monitor every point in the process, providing a visual rendering of the plant’s floor plan, with flow activity represented in real time. The plan is to launch small, in grocery chains that extend midway up the East Coast, and see how the public reacts. But even once launched, Bo expects that retail would only be 20% of the business, with the majority remaining in foodservice. But before he takes any of his products direct to the consumer, Bo wants to build a solid foundation in the foodservice business. As such, he’d like to grow his line of products over the next two to three years, expanding in protein and in areas such as Halal lamb and goat. He’d also like to expand beyond meats. “I have a big interest in getting into the baking aspect of foodservice,” he said. Why baking? Bo knows baking as well as he does cooking. Just before Mrs. Smith’s Pies was sold to Schwan Food Company in 2003, Mrs. Smith’s had made a deal with Bo to replace its sweet potato pie with his recipe. When the Schwan’s purchase put all new products on the back shelf, Bo took back his recipe, and now wants to eventually produce it under his own name, along with such products as dressing, mac and cheese, and other homemade goods. CELEBRATED ATHLETE TO QUALITY FOOD. “I know that it is because of my sports career that I am where I’m at, but I don’t want to be looked at as one-dimensional,” Bo said, adding that he has been offered various coaching jobs through the years, but he wanted to get into something different. His sports career has been documented in numerous publications, including the 1990 autobiography, “Bo Knows Bo,” and the 2012 ESPN 30 for 30 documentary, “You Don’t Know Bo.” In these, Bo said that when he dies, he would like his tombstone to read: “Here lies a ball player ... that gave as much as he received.” Given all he has accomplished since his ball-playing days, what would Bo want it to say today? “Treat your fellow man as you want to be treated,” he said.